Loving pet bolws are winning pet bowls and for good reason functational and beautiful wooden base with stainless steel bowls top easily removable , they are sure to brighten uo the space and make feeding fun| .Vet recommend stainless stell interior. .Naturall bacteria resistance. .Capacity is calculated by total volume. 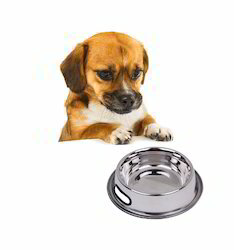 Among our wide range of products, we are offering a premium quality assortment of Stainless Steel Dog Bowl. Handcrafted By Expert Artisians Finished, Packed Through WellTrained Workers Under The Supervision of rich Experienced Team members.Double Slainless Steel Dog Bowl. Size Top Dia 8 inch x Height 5 inch x Bottom Dia 4 inch. Live the luxurious pet life with our Dog Bowls. These Bowls feature removable, bacteria resistant stainless steel bowls. The removable skid-free rubbers base help ensure quiet, spill-free dining. 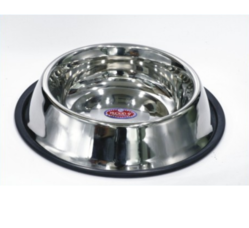 size: 16, 24, 32, 64oz"
The Dog Bowl, offered by us is ideal for serving food and milk to the pets. Designed using stainless steel, these bowls are elegant in looks and resistant to corrosion. The smooth finishing and polishing of this bowl ensure long-lasting sheen and durability. Clients can get this bowl from us at highly competitive price. We are the leading manufacturer and supplier of Stainless Steel Dog Bowls for Crates. We offer these in various shapes and designs as per the needs and choice of our clients.